The picturesque Harley Clarke Mansion, home of the Evanston Art Center, is a bit of an architectural sampler in the sense that it features turrets, balconies, gables, dormers and stone carvings. One of my plein air students has fallen in love with the entrance to the greenhouse, which combines a Palladian reference and a carved wooden door frame with overgrown vines. In previous sessions she drew the door itself and the view towards the Clarke’s ornamented main entrance. 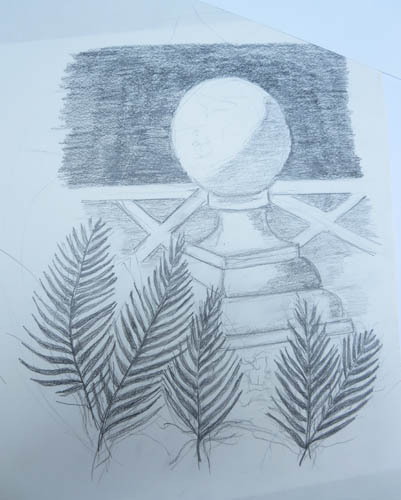 This week she turned to draw one of the cement globes that announce the fern-and-lily lined passage to the greenhouse. 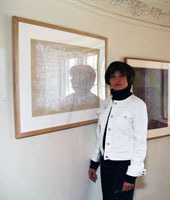 When Linda’s drawing was finished, we considered cropping possibilities. 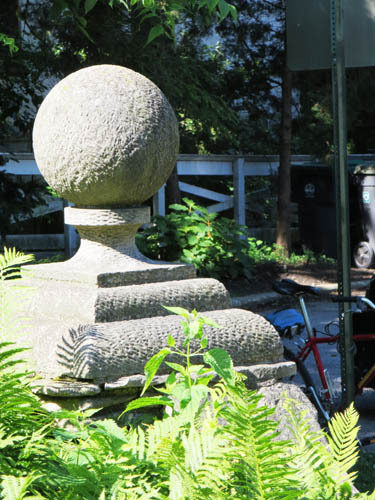 The fence in the distance behind the globe forms a sturdy horizontal line. Perhaps too sturdy. 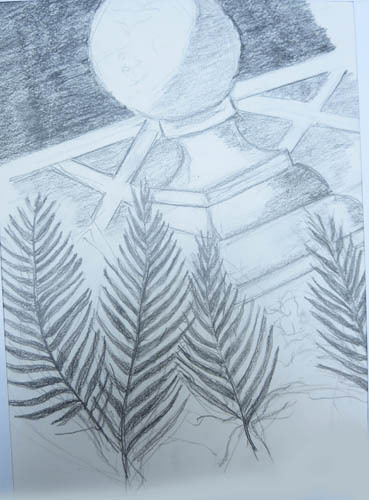 When the drawing is cropped conventionally with the fence horizontal, the image is, well, too conventional. Notice what happens when we tilt the drawing and chop off the top of the globe. More tension, more movement.